No high-res picture this time, just a summertime image. I took it Aug 9, 2011. 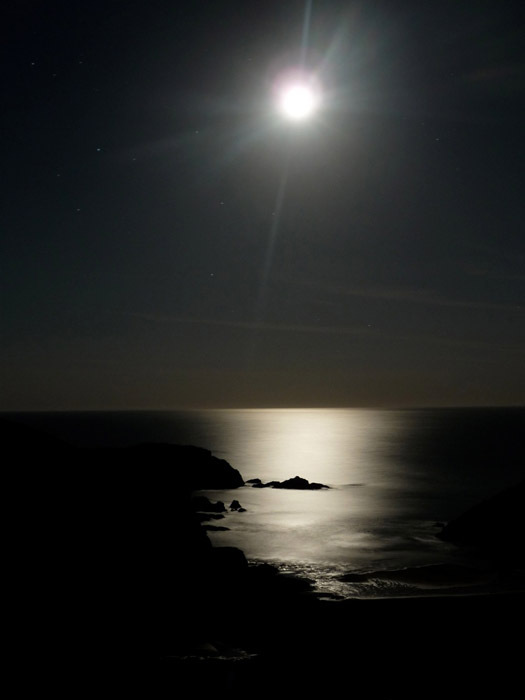 A 10-day-old Moon was crossing the constellation of Sagittarius, low on the horizon, lighting the rocky shore of a small island called Belle-Ile, in the south of Britanny in France, where I was spending my holidays. The moment was absolutely magic, with Moon light reflecting on the sea and just the sound of the waves breaking a few tens of meters lower. I remember having imagined that I was sitting on the border of Sinus Iridum on an imaginary Moon having true oceans and watching the distant Earth, lit by the Sun. Aug 9, 2011 - 21h23 UT. Panasonic TZ-4 Digital camera on a small tripod. 60 s exp (night scene mode). No further processing. This page was last modified on 9 February 2015, at 01:23.